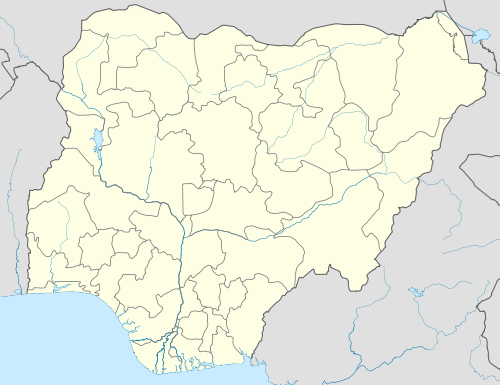 Akure is located in southwestern Nigeria. The climate is hot and humid, influenced by rain-bearing southwest monsoon winds from the ocean and dry northwest winds from the Sahara Desert. The rainy season lasts from April to October, with rainfall of about 1524mm per year. Temperatures vary from 28oC to 31oC with mean annual relative humidity of about 80%. The area has long been populated. Skeletons of homo sapiens dating to the tenth millennium BC have been found in a burial site at Iwo Eleru near to Akure. Rock engravings dating back to the Mesolithic period, have been discovered on the outskirts of Akure at Igbara-Oke, declared a national monument on 13 March 1963. Oral tradition states that Akure was founded by a prince named Omoremi, son of Ekun and grandson of Oduduwa Omoluabi, the royal progenitor of the Yoruba tribe. The Prince left Ile-Ife, his grandfather's kingdom, in search of a place to settle after passing a strict test administered by Oduduwa himself. This test wherein he was kept in solitude for about nine (9) days is still annually commemorated in Akure today by the reigning king of the town during a ceremony known as 'Oba wo ilesunta'. At the point where the prince and his party arrived at the exact location of the modern city, the string holding the heavy royal beads on his neck is said to have snapped, thus causing the people to exclaim "Àkún rę" (or The beads have snapped), this later becoming the name of the settlement they established on the site. Over time, the phrase was wittled down through its constant use to become Akure. Omoremi is said to have hunted with his entourage while on his way from Ile Ife. He arrived in Akure and was proclaimed the Person who hunted and arrived with royalty, i.e., Asodeboyede. Originally, the kings of Akure that were born of him were referred to as Ajapada. The title Deji of Akure started with Oba Arakale, whose father took the daughter of Oba Atakumosa, the Owa of Ijeshaland as one of his wives while the latter was on his way to Benin. By the time Oba Atakumosa was returning to Ilesha from the pilgrimage, his daughter (Owawejokun) had given birth to a son. While other dignitaries gave the little baby common gifts, Oba Atakumosa was said to have presented his grandson with a small diadem. Owafadeji i.e., Owa gave him a diadem or royal crown became the nickname of the young boy, and by the time he reached his adulthood it had become his de facto name. When Owafa'Deji became Oba, the appellation assumed a titular importance and because of his prominence as an Oba, subsequent Obas or kings assumed the title while the advent of the modern era has formally made Deji the official title of the Obas of Akure. However, the original title of Ajapada has remained a significant part of the Deji's ceremonial style till the present day. The Oba's Palace in the centre of the town was built in 1150 AD. During its long history, the city-state of Akure was at times independent, at times subject to other states. There is a sizable population of Bini origin. Akure was the main base for Benin's trade in the area, and at times seems to have been considered within the western frontier of Benin. The Benin historian Egharevba refers to suppression of resistance by "rebellious Akure" during the reign of Oba Ewuare of Benin (1440–1473), although the king was allowed to remain as nominal ruler. Another rebellion is recorded a century later during the reign of Oba Ehengbuda of Benin. Akure had regained independence by the early 19th century, but around 1818 it was recaptured by Benin forces and the Deji was executed. After 1854, Akure and other Ekiti towns came under the rule of Ibadan, which lasted until a rebellion in 1876 followed by a prolonged war between the Yoruba states. Towards the end of the 19th century the British based on their Lagos Colony had established a protectorate over the area, although they ruled through "native" administrations. The British sought to combine the Ekiti kingdoms of the region into a single administrative unit, against resistance by the Ekiti people who preferred local autonomy. In 1899 Ekiti and Ilesha formed the northeastern division of the protectorate. In 1915, Ekiti, Owo and Ondo were combined to form the Ondo Province with headquarters at Akure. Ondo Province later became part of Western State. In 1976 the old Ondo State was formed, and in 1996 Ekiti State was split off from the modern Ondo State, which has Akure as its capital. The death in October 1999 of Oba Ataiyese Adebobajo Adesida IV led to a prolonged dispute over the succession, eventually resolved with the appointment of Oba Oluwadamilare Adesina in 2005. Oba Oluwadamilare was dethroned on 10 June 2010 for sacrilegious misdeeds (wife beating) and Adebiyi Adegboye Adesida Afunbiowo II was chosen as the new Deji of Akure on 13 August 2010. His daughter, the Omoba Adetutu, was appointed princess regent following his demise on the 30th of November, 2013. Akure's King is known as the Deji of Akure and is supported by six high chiefs or Iwarefa in his or her domain. The totem of Akure is the Leopard and the father of Omoremi Omoluabi was himself called Ekun (this was his regnal name). It is for this reason that every descendant of the Akure clan has been addressed by outsiders as Omo Ekun during the recitation of his or her praise poetry or, alternatively, as 'Omo Akure Oloyemekun', since Omoremi was said to have stayed for a while at Igbo Ooye before coming to the Akure region. There are several Ruling and Royal houses of Akure, including the Osupa Ruling House which includes the Odudun Royal House and the Ojijigogun Ruling House which includes the Faturoti, Adesida and Arosoye royal houses. After the death or removal of an Oba, a princess regent is appointed, who is expected to oversee the day-to-day administration of the kingdom while the kingmakers select the next Oba from one of the royal houses. Although the Oba has relocated to a more modern palace, the old building from 1150 AD is still used for all ceremonies. The place has over 15 courtyards, with each having its unique purpose. Ua nla, Ua Ibura, Ua jemifohun, Ua Ikomo are some of the names of the courtyards. For example, in the Ua ubura courtyard, oaths are taken, and the ua Ikomo is used for naming ceremonies. There are two other constituent communities with their separate chiefs and traditions within the modern Akure kingdom. The more prominent of the pair is Isikan while the second of them is Isolo. The Baale of Isikan is known as the Iralepo while the Baale of Isolo is known as the Osolo of Isolo. In the olden days these were separate towns, but they were brought together under the nominal control of Akure as a result of a number of wars. 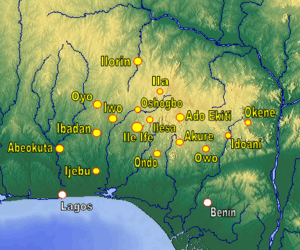 Nearby towns include Ilara, Igbaraoke, Iju, Itaogbolu, Idanre, Owo, Ikere and Ondo. ↑ James Sowole (14 August 2010). "New Deji of Akure Gets Staff of Office". ThisDay. Retrieved 13 September 2010. ↑ Igbekele Ajibefun. "Akure City Profile" (PDF). International Water Management Institute. Retrieved 19 September 2010. ↑ Festus Eribo (2001). In search of greatness: Russia's communications with Africa and the world. Greenwood Publishing Group. p. 8. ISBN 1-56750-532-5. 1 2 MAURICE ARCHIBONG (6 August 2009). "Struggles to breathe life into National Museum Akure after 21-year dormancy". Daily Sun. Retrieved 18 September 2010. 1 2 Robert Sydney Smith (1988). Kingdoms of the Yoruba. Univ of Wisconsin Press. p. 134. ISBN 0-299-11604-2. ↑ Jeremy Seymour Eades (1980). The Yoruba today. CUP Archive. p. 9. ISBN 0-521-22656-2. ↑ Andrew Herman Apter (1992). Black critics & kings: the hermeneutics of power in Yoruba society. University of Chicago Press. p. 166. ISBN 0226023427. ↑ "Former Nigerian Presidential Aide, Adebiyi Adesida, Becomes the New Deji of Akure". SharpEdgeNews. 12 August 2010. Archived from the original on 17 August 2010. Retrieved 13 September 2010. ↑ "46th Deji's tortuous journey to Akure palace". NIGERIAN COMPASS. 13 September 2010. Retrieved 18 September 2010. ↑ "Ondo removes Akure Oba". Next. 10 June 2010. Archived from the original on 6 August 2010. Retrieved 18 September 2010. ↑ Dr. Wunmi Akintide. "DEJI OF AKURE – PART 8". Gamji. Retrieved 18 September 2010.